Making invisible things tangible, unspoken words expressed, creating things new, self-expression, experiment, play. These are the starting points for my work. Music is clearly present in my works. For me, form and music speak the same language. Rhythms and nuances flow through each work. I prefer simple and delicate melodies. In my experiments with many different materials, I have been fascinated by the expressive power of glass and the technical challenges that it presents. As well as the visual solutions, my mind can continually be thinking about the physical problems of modifying glass. In shaping glass, I use all kind of heat processing, slumping, flamework, pâté de verre, lost wax casting, sand blasting, etching, and engraving, as well as traditional copper foil and lead techniques. In my work I employ used glass; I recycle. My raw material might have spent 80 years filling a casement in a house or a few months as a shop display window until some chance caused it to crack. I do not paint on glass but with glass. 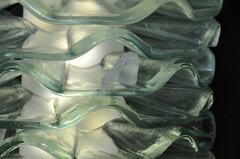 Three-dimensional surface textures form the shape of the piece. Glass provides answers to different problems of interior decoration: at the same time that it hides a view, it allows the light to pass through it. 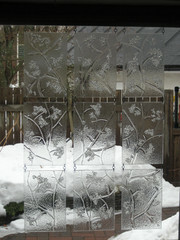 A work made from colourless glass varies according to its background and the time of day. In combination with lighting, my work can add variation and provide often unexpected aspects. Colourless glass, in different lighting conditions and environments, acquires countless new subtle shades. In the middle of present-day floods of garish stimuli, this peacefulness gives the viewers the space to make their own interpretation of the work.